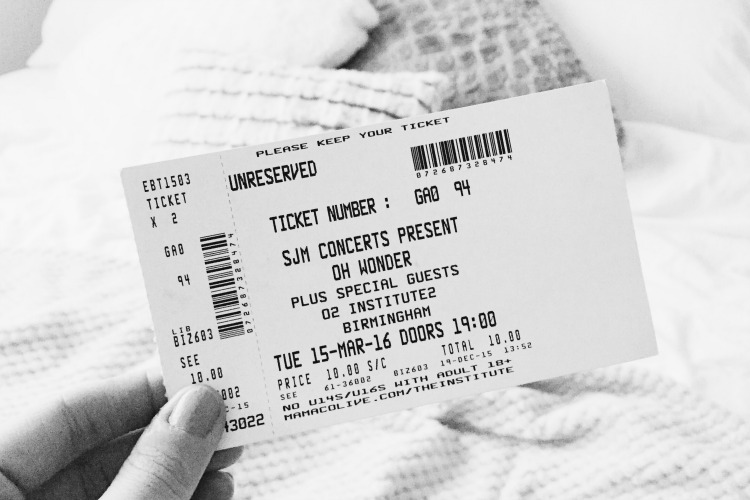 This year, I was introduced to Oh Wonder (not them actual selves, I mean, that would be intense. For them more than me) and quite honestly, they've appeared in every one of my playlists I've created in the last few months, and played constantly because basically,I just can't stop listening to them.As you know from my previous music posts, I'm all about the chilled songs, the ones that are perfect for a lazy Sunday morning or an afternoon chilling in the park drinking fizz with the girls. Actually, I like listening to that kind of music anywhere and everywhere (I'd even stretch to say running. Maybe that's why I run slow? Who am I kidding.. I don't run anymore! ), so for me, Oh Wonder are up there. They fit my bill. Just so.And on Tuesday evening, I popped on my leather jacket and suede boots and went to join a room full of teens to see them for myself, at The Institute in Birmingham. Because that place rocks.They did not disappoint (not that I thought they would anyway..). Supporting Oh Wonder, were another band who'd appeared in my Clouds playlist recently, Aquilo - who filled the room with their soft and calm electro pop vibes. They performed two of my favourites with I Gave It All and You There which definitely left an atmosphere that was a combination of calm and dreamy, even if a little sad and heartfelt. But hey, I'm all for those songs - and brownie points to Oh Wonder for having them as their support act!Oh Wonder themselves, made up of Josephine and Anthony, were everything and more at a gig. With the intimacy of such a venue like The Insitute, they performed their debut album with such passion and delicacy for their fans, that it almost left me wishing I was a musical creation (it's best I leave my singing just to the car...) Having Josephine's softening voice alongside Anthony's calming notes compliment each other ridiculously well and have you utterly caught on every single lyric that is sung, and having them both co-lead the vocals really gives a focus from both the male and female view. They remind me of the likes of Angus and Julia Stone with their mellow alt tunes and incredible talent.They performed what was my favourite songs, All We Do and Without You, which were even more incredible in person, and after hearing Landslide live, I'm a complete Oh Wonder fan. Not only is it a beautifully written song but seeing them play with such passion and happiness with the crowd joining in, made this the winning song of the night for me.I've since decided that actually, it's my new favourite one of theirs.So much that I've not stopped playing it all week (already I know! ).Oh Wonder, you've become my ultimate top artists to see live.Now if you don't mind, I'm off to listen to Landslide over and over, whilst I dance around the house in my pants. Yes. Music does that to me..